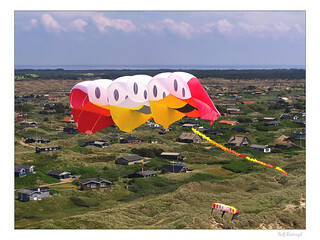 KAPshop - equipment for Kite Aerial Photography, aerial photography using kites (KAP), balloons (BAP) or poles (PAP). And drones, of course. Width: 300 cm / 118"
Height: 266 cm / 105"
Line	rec. : Polyester 250 kg / 550 lb. This kite comes with 3 7m (20 ft) Fuzzy Tails in a sturdy bag. The bag can be used as a sand anchor. This product was added to our catalog on dinsdag 14 februari, 2012.